for up to 42 passengers. for up to 49 passengers. The above prices represent cash discounted prices. 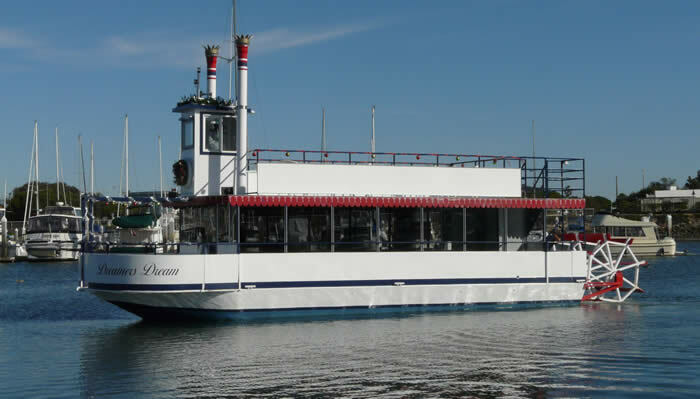 Holiday Cruise Prices Times apply for events during December. If you pay with debit or credit "Dreamer" is $550/hr & "Dreamers Dream" is $663/hr. The food program is $23 per person Credit/Debit or $20 per person cash discount. "Dreamers Dream" is certified by the United States Coats Guard to accommodate up to 49 passengers. "Dreamers Dream" is an in harbor boat only. chairs will be provided. Boat must be left as when chartered or a $150+ cleaning charge will be added to the bill. All prices listed do not include sales tax, bar, food and an 18% svc. charge that is added to each event. canceled will be charged for the entire charter bill.